See some of the print possibilities with inkjet presses from Canon Solutions America. 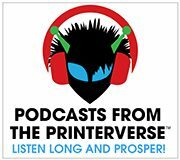 Step up your print marketing game… Peacock Long and Prosper! Project Peacock is produced by Print Media Centr.